Vienna is big, but the diversity of Viennese bicycle marques was once much bigger; more than 100 marques existed in the city from the 1930s to the 1980s, among them innovative, oblique, noble, freakish, good dependable, solid and off the peg, - for example, noble racing bikes with paint finishes from another time (Rih), Aero bicycles from 50 years before the aerodynamic craze (RZ), prototypes from aluminium and small diameter steel tubes (Austria-Alpha), lugless welded frames (Degen), rethinking of frame design ( Wisent Einheitsrad), to name but a few examples. For the first time, the complete history of the Vienna bicycle marques in a picture book, with all marques from Alpenrad to Ziel. I found the contents of the book fascinating. It educated me as to the variety of different bicycle makers working in Vienna, some from the 19th century onwards, others appearing for a few years after WW2, then disappearing. The bicycles used to illustrate the book are well photographed and in some cases I would have liked to have seen a little more detail, such as head lugs etc. However, I'm sure the authors were forced to cut down the amount of material, to be able to make the book format and they have done a superbe job. The book has the following chapters:- Introduction (Prolog), Authors thanks (Dank), The bicycle marques A – Z (Wiener Fahrraedermarken A - Z), Puzzling machines (Ratselhafte Gaule) , And now? (Und Jetzt? ), Picture index (Abbildungsverzeichnis), Bibliography (Literaturverzeichnis) and finally about the authors (Uber uns). The book is printed on glossy art paper, and each marque is given an introductory text box showing the years of production, the company address, the owner details and whether they built their own machines or not. There is then narrative text, accompanied by the superbe photographs. The authors have a passion for their subject and have done their research well, as they mention some bicycle makers lost in the mists of time, of whom, only a printed advert from a newspaper or magazine show they existed at all. The cast aluminium RZ / Err-Zett children's bicycle illustrated on page 235 of the book and on the front page of the publisher's website, predates the Kirk Precision cast magnesium frame by some years. The authors record 'Wem dieses Design einfiel, ist leider nicht uberliefert, vielleicht war es ja ebenfalls Ottomar Rosenkranze selbst' – 'Whoever came up with this design, is unfortunately not recorded for posterity, but perhaps it was Ottomar Rosenkranz himself'. The frame material used in the Kirk Precision may have been different, but the concept of a cast frame was clearly established much earlier by RZ / Err-Zett and gives weight to the old saying 'There is nothing new under the sun'. The book has a small section pages 332 – 338 on puzzling machines (german jocular chapter heading meaning enigmatic old nag, or gift horse!) which the authors believe to be Austrian bicycles made in Vienna but of which they have little or no information. The book finally brings the story up to date with information on modern framebuilders working in Vienna. The book can be bought via the publishers website and is now available through Amazon, the ISBN number is 978-3-85119-342-8. If you order a book through the publisher's website, you will be sent an invoice in Euros, which will have to be paid through your bank. Once payment has been made, delivery to the UK takes around two weeks. The book is well worth the money and is cheaper than some of the recent Japanese and US books on Toei, Singer and Herse. The authors have set out to record methodically the custom built marques originating in Vienna over a 50 year period and add considerably to the body of historical knowledge. It shows what can be done and it would be nice to see a similar work published on the framebuilders working in the London area over a similar time period! The only caveat is that if you rely on an internet language translator, you will get a literal translation of the words. The danger here is that you often need to translate the concept, not the literal words, to make sense of what is meant by the authors. 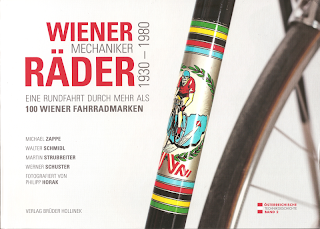 However, it has been a very enjoyable and educational time spent with my old German dictionary and this book, discovering the delights of the Vienna bicycle trade. I can heartily recommend it.